Draper Case for Ultimate Access Screen - 12'5-5/8"
Case is finished white. Back, top and front are made of extruded aluminum. Endcaps are made of stamped steel. Bottom of case consists of an independently motorized trap door that opens up inside the screen case. The trap door and the access door both hinge downward to allow access to inside of the screen case. The door remains attached to the screen case via a concealed full-length hinge. Releasing one latch at each end of the screen case allows the doors to hinge downward and a prop arm at each end may be pivoted to engage with endcaps, keeping the door assembly in its fully open position. Symmetrical case allows for viewing surface to unroll from the back or front of the roller. Internal junction box allows case to be installed and pre-wired to building supply. Junction box to have two plug-in style connectors mating with connectors from motorized roller/fabric assembly and motorized door assembly. Case flange to trim edges of ceiling opening. 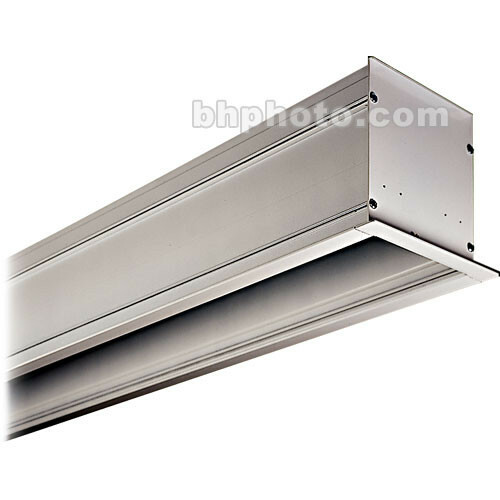 Case may be mounted with 3/8" threaded rod at ends or along length with lag screws through brackets or with wire in a grid ceiling. Mounting brackets slide in channels on top of case allowing brackets to be moved somewhere to avoid interference with conflicting building structures. Brackets lock in position by tightening set screws. Box Dimensions (LxWxH) 170.0 x 13.0 x 12.0"